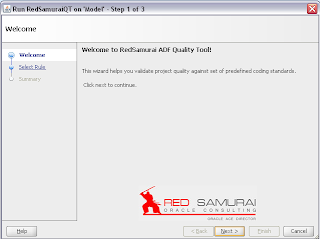 We have developed 1.1 release for Red Samurai Tool - it includes several bug fixes and improved report structure. 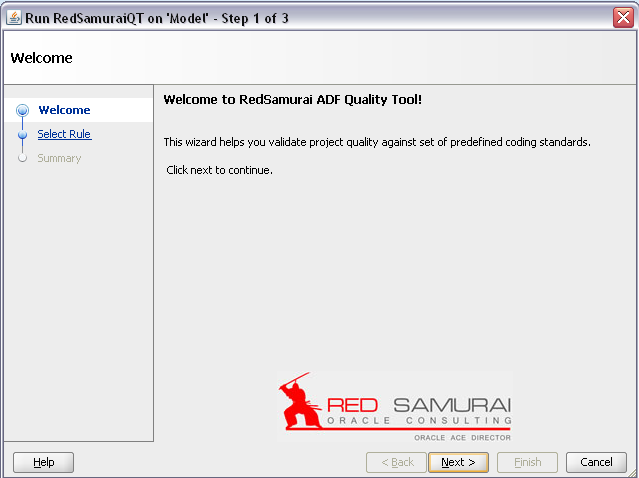 More about Red Samurai JDeveloper extension you can read from my previous post - Red Samurai Tool - How To Check ADF 11g Package Structure and ADF Task Flows Parameters. 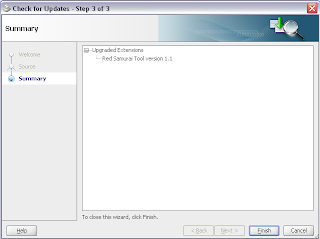 Download new version - redsamuraitool_1.1.zip. New version will be available directly from JDeveloper 11g PS2 updates center very soon. Now you can install it manually as well, through JDeveloper 11g PS2 Check For Updates wizard. Sample JDeveloper 11g application to test quality checks - RedSamuraiToolTestSample1.zip. I want to create a DataBase explorer extension to lookup all db component. after selecting some component i have to generate some xml files. Can you please guide me how i can develop such extension? I have download extension sdk and going through some sample. But i am not able to figure out how to develop DB explorer. (1) Can we add our own rules in Red Samurai Tool? (2) Can we integrate Red Samurai with Ant build script? Both possible, but requires additional functionality - not included with version from JDev extension center.